Thomas Talbot of Margam, and by descent. Anon. sale, Christie's London, 9 December 1986, lot 126. One of a series of drawings contained in an album mentioned in the 1697 will of Stella's niece, Claudine Bouzonnet-Stella: 'Un petit portefeuille, aussi d'environt 16 pouces de haut sur 10 de large, couvert de parchemin, dans lequel sont vingt deux dessins très finis, ombré avec l'encre de la Chine, lesquels représentent la vie de la Ste. Vierge. Il y a aussi les traits desdits desseins qui serviront, s'il estoit gravé, affin de ne pas gater les desseins en les contretirant sur le cuivre, lesquels desseins sont de la mains de mon oncle M Stella, et doivent estres considéré.'(sic). The drawings, as well as a now lost series of engravings after these by Antoinette Bouzonnet-Stella, were inherited by Michel de Masso, a relation of Jacques Stella's mother. The drawings are recorded in the possession of Gaetano Monisi Romano in 1756 who advertised them as by Nicolas Poussin. Romano in his advertisement, first published by Anthony Blunt, gives a list of distinguished painters, sculptors, architects and dilettanti in Rome who supported his project to have engravings made of the drawings. 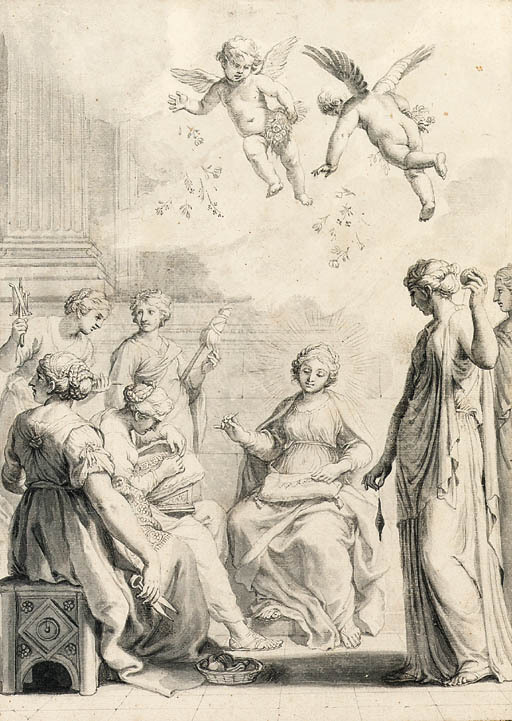 The series engraved by Polanzani was published in 1756 and reissued in 1783, while copies were engraved by Alessandro Mocchetti before the end of the 18th Century. Although Mariette correctly attributed the designs to Stella when sent the series of prints in 1756 (he owned a set of the Antoinette Bouzonnet-Stella engravings bearing the right attribution), the drawings were sold as by Poussin to Thomas Talbot (1747-1806) who was in Rome about 1776.